Did your mother support your music career? Yes, she did because she was also a singer. She always sang around the house. She believed that one didn’t have to be immoral simply because she is a singer. Every other member of my family was not pleased with my music career but my mother never took offence. She taught me that a female shouldn’t be too close to men. For example, I was never bathed at the same time with my male siblings. My mother used to check if my virginity was intact every three months interval before I got married; especially whenever I returned from movie locations. 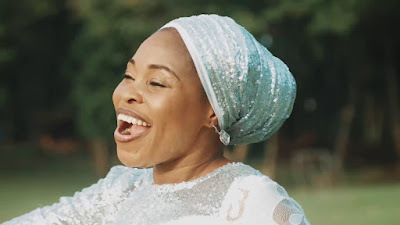 When I newly got married to my husband, we went to the National Theatre in Lagos to watch a movie and actors like Yinka Quadri, Ebun Oloyede, among others were there. When they saw my husband, they congratulated him and told him that he had chosen a good and exemplary wife. That made my husband quite happy. My mum was very strict and she never spared the rod. She also showed me a lot of motherly love. What are some of the lessons your mother taught you that have endured till date? My mum always taught me to be respectful. She mandated me to always kneel when greeting elderly people and I still do that till date, even for people I am older than. How often do you get to spend time with your children? I thank God because He is the one that has raised the children for me. I am very grateful that my children are godly. Even when guys approach my daughter, she tells me about it because she knows that even if she doesn’t tell me, God would reveal it to me. Whenever we are together, I tell them about God. These days, kids have access to information from a lot of places. If God is not involved, they may not turn out well. I have learnt that it is very good to be friendly with your kids so that they can relate well with you. I play a lot with my kids. If children are not shown love in the home, they would seek for it outside. What other childhood ambitions did you have? I wanted to become a fashion designer. I studied Mass Communication; I also thought that I would end up as a broadcaster or a correspondent. However, I have always loved acting and I joined a theatre group when I was in secondary school. My dream then was to become a star actress. How did you start recording soundtracks for movies? I started my entertainment career as an actress and back then, they didn’t do personalised soundtracks for movies. One day, one of my colleagues, Adio Majesta, said I should be able to compose songs for movies. He told me the title of the movie and that was how I started making soundtracks for movies. He believed I could do it because I always sang whenever we were on location and sometimes, I used the incident happening at that particular time to compose songs. Would you still love to be a movie star? I still love to act but right now, there is no time for that. I was recently approached to act in a Christian movie but I haven’t been able to go on set because of my busy schedule. How would you describe your experience as an actress? I joined the group, Jesters International, in 1983, and I started acting with Papilolo and Aderupoko. There were times that I would be on location for several weeks, yet I wouldn’t be given any role. I used to feel frustrated but I didn’t know that God had another plan for me. Now, I have more fulfillment as a singer. I have the opportunity to minister to people and break yokes. I don’t take all that I am for granted. When was your breakthrough moment in your career? I became very popular when I released the album, Ore ti o Common. I didn’t think that people would like the song because it was the ‘cover’ of a makossa hit. The original song didn’t have any moral message but I decided to change it to a gospel song. People really loved and accepted the song. Meanwhile, I had released two albums, Ikoko Dudu and Baba iwo la k’epe, before then but they weren’t successful. How have you been able to manage your marriage and career so that none suffers? Are any of your children following your footsteps in music? Yes. My first daughter, Ayomikun, is currently studying music in the university. She often tells me a lot of things about the rudiments and intricacies of music. I actually wanted her to study medicine but she chose music. She writes good lyrics and I respect her for that. Aren’t you disappointed that she chose music over medicine? I am happy with her choice. I had told God that the children should become whatever He wants them to become; and not just my wish. You recently built a house in Iju, Lagos. Why didn’t you go to a highbrow area like Lekki? I believe that God is everywhere. I have always lived in this area and I am comfortable with it. This place where I live is very peaceful and I am sure that if the people in Lekki get to know about it, they would want to move here. Some people regard gospel singing as a calling. How do you draw the line when charging clients? Some people had been doing this job before we started. Most churches know that they have to give honourarium. Till date, there are some places we go to minister and do not charge a dime; they would give us whatever they like. However, in some places, they could take us for granted if we don’t tell them what they are required to pay. For about 15 years in my ministry, I didn’t charge anybody. I recently started to do that because I realised that people were taking us for a ride. There was a particular church we went to minister and at the end of the programme, they gave us N300, and the place wasn’t even in Lagos. How am I supposed to share that with my band? There have been lots of experiences like that. This is the only job that I do and I have several responsibilities to cater to. Why did you decide to start marketing your albums yourselves? Marketers usually told us that they sold low figures and it was often difficult to get money from them. That was why we decided to set up a structure to sell our albums ourselves. We usually see the CDs everywhere; yet, the marketers would tell us that people are not buying. So far, the experience of selling the albums ourselves has been great. How would you describe the experience of working with your husband? I enjoy it. Gentle people (like my husband) are conservative and reserved. I like the way he is because we have opposite characters. I spend and shop a lot but he is someone who believes in saving money. At every point, he knows what he is doing. Gentle people may be stubborn but it usually helps us to achieve certain things. My husband motivates me a lot. Even the people that work with him in the office love him very much. He might be stubborn, but he is not a troublesome person. He is a very lenient person but whenever he is tired of you, nobody can convince him otherwise. How do you make sure that misunderstandings with your husband at work don’t go home with you? We often take some of them home. At times, we have misunderstandings on stage. He usually frowns at me whenever I don’t get something right on stage, and sometimes, he communicates with me using the piano. He also doesn’t like it when I talk too much on stage. He often tells me to greet people briefly and go straight to my song delivery. In cases like that, I always apologise first because I like saying sorry. I like to look good. You shouldn’t say that because you are a Christian, you wouldn’t look good; things have to be balanced. I like to wear good outfits, and they don’t have to be so expensive. My father was a tailor and I know how to design clothes. Sometimes, I sketch the attire I want and give it to the tailor to make it. Sometimes, my husband and I travel to be alone together for some days. During that time, I would sleep well and go for massages. I also love to watch movies and play table tennis.